Seeing through Listening. 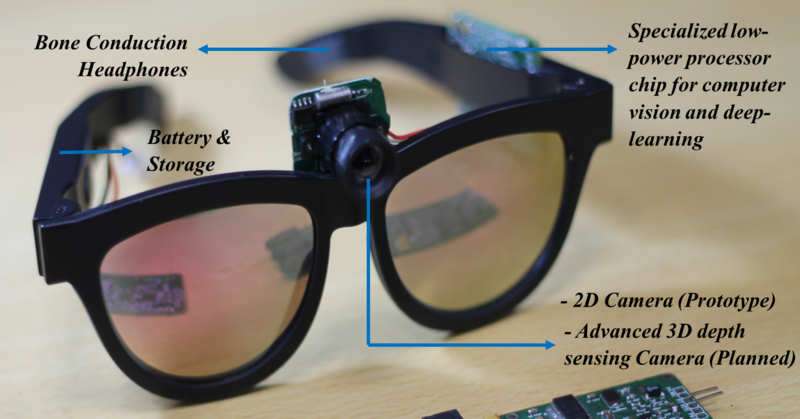 A smart eyewear for Visually differently-abled. Inspiration - Origination of Idea! Our product, ViShruti™ is a wearable smart eyewear that has assistive artificial intelligence capabilities for the visually differently-abled. It provides a comprehensive understanding of the environment that can assist the visually differently-abled to navigate independently, search and manipulate objects and provide facial recognition capabilities. Hence, it helps in uplifting the visually differently-abled to lead an independent and digitally connected life. The current market solutions that address the visually differently-abledare either basic in nature with limited functionality, are bulky, expensive or does not utilize data efficiently.